Barrackpore Muslims mobilized and assisted those who were affected by the flooding in southern Trinidad. Over 1700 meals, 1500 cases of water, and food hampers were delivered to Woodland, Debe, Penal, Barrackpore, St. Marys, Moruga and Mayaro. Heavy rain that started Wednesday, October 18, 2017 caused major floods in parts of Trinidad and Tobago, leaving numerous submerged homes, roads and farms and thousands of marooned citizens. The threat for moderate to heavy showers, additional flooding and landslides continued across the country over the weekend and into next week. The Trinidad and Tobago Meteorological Service maintained the riverine flood alert for Trinidad due to the rainfall activity associated with the Inter-Tropical Convergence Zone (ITCZ) for over 48 hours, Met Office. As opposed to Street and Flash Flooding, Riverine Flooding is more prolonged and widespread, it said. During a media briefing held last Saturday, Retired Colonel Dave Williams deputy CEO of the Office of Disaster Preparedness (ODPM) told reporters, “You see this as a big thing? For us this is a small thing”. He also said that all systems failed but the ODPM did not. Prime Minister Dr Keith Rowley, during a tour of flood-hit Mafeking, Mayaro on Sunday, announced that the ODPM would be reviewed as he did not believe the people with the right “aptitude” nor “attitude” operated at the organisation. The National Security Ministry issued a statement which confirmed the resignation of Williams as ODPM’s Deputy CEO. It said Captain Neville Wint, ODPM Relief Officer, will act as head of the organisation. 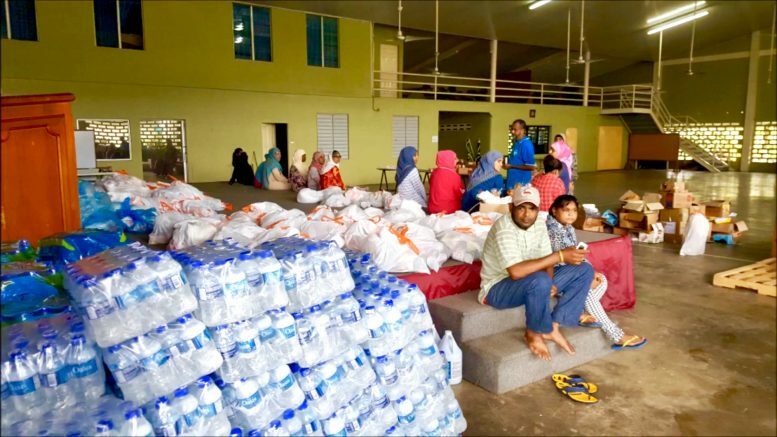 Be the first to comment on "Barrackpore, Trinidad Muslims Mobilize To Assist Flood Survivors"